My Son Has a Learning Disability. What Can I Do to Help Him? Home » The Law & You » My Son Has a Learning Disability. What Can I Do to Help Him? A viewer’s son is starting middle school next year and has a learning disability. The viewer is concerned and wants to know what he can do to help him. Pennsylvania attorneys Ed Ciarimboli and Molly Clark offer some advice. Dave Kuharchik: We have a unique question today involving a learning disability. We’ll get to it now on “The Law & You.” Attorneys Molly Clark and Ed Ciarimboli are back. Greg is still MIA, we’ll see him soon, I’m sure. Ed Ciarimboli: We brought the smile. Dave: I can see that. Very friendly smile. Ed: Greg has promised he’ll smile more. Dave: Sometimes, he forces it. It doesn’t seem natural. All right, Paul in Weatherly says, “My son is in the sixth grade and heading to the middle school next year. He has a learning disability. What can I do to get him help?” What do you say to Paul? Ed: Yeah so, Paul, we’ve seen a lot of these questions in the course of the last year. What you want to do is you want to get your son tested and ultimately what they want to put in place is something called an IEP. It’s an Individualized Education Plan which is going to allow your son or daughter who have a documented learning disability, they will allow them for more time for testing, note taking, things of that nature. But there are some things that you need to do, I’m going to let Molly tell you about some of the requirements both from a documentation standpoint and a doctor standpoint in order you can make sure you protect your son’s rights. Molly Clark: Yeah, it’s very important that you stay in communication and in contact with the people at the school. Most schools have a teacher assigned to that, administrators that specialize in that, to help you out with that. So, I would definitely stay in communication with the school. You also going to want to get in touch with the medical providers and get the medical documentation to support the problems that your child has and then they can help you. Like Eddie said, get an IEP in place and you go from there. Dave: And don’t forget if you need the help from Fellerman & Ciarimboli, you can give them a call, check them out online or even Snapchat a question. Ed: Snapchat, Instagram, we’re still waiting. Dave: It’s going to happen. Sooner or later. Ed: First Snapchat gets a t-shirt, a mug, a swell bottle. Dave: The t-shirts are awesome, you’ve seen me sport one. I love it. 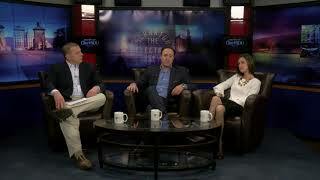 Dave: Results matter with attorneys Molly Clark and Ed Ciarimboli, we’ll see you next time.